presenting on the development of EIGRP. 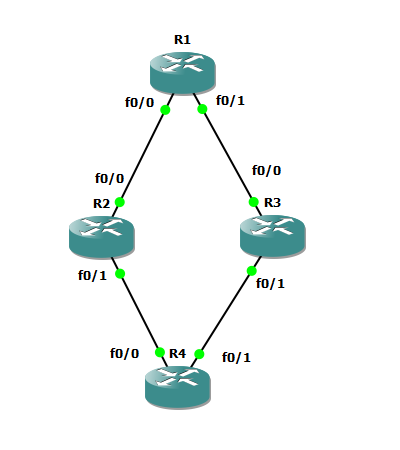 We start out with the following topology. 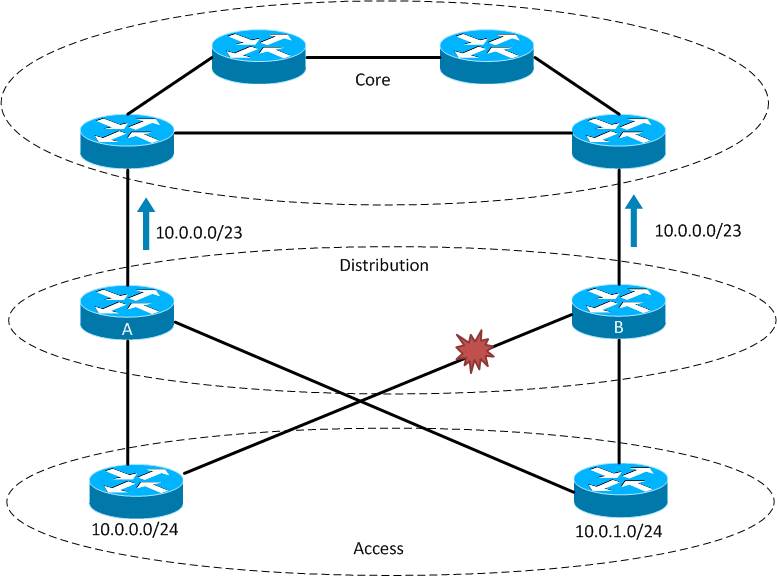 From here we can shutdown the process or configure different address families. 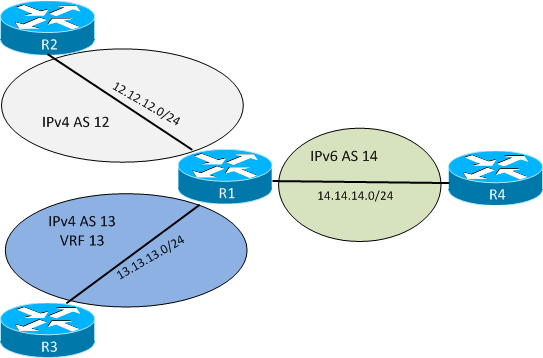 We start by setting up IPv4 in the global table. 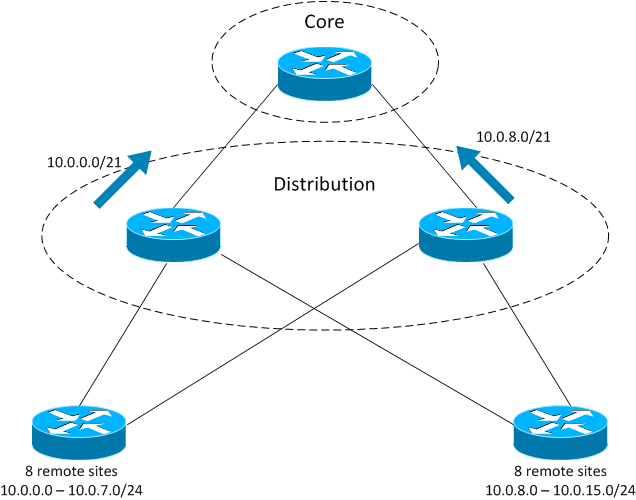 From here we define networks, setup static neighbors and configure EIGRP parameters. 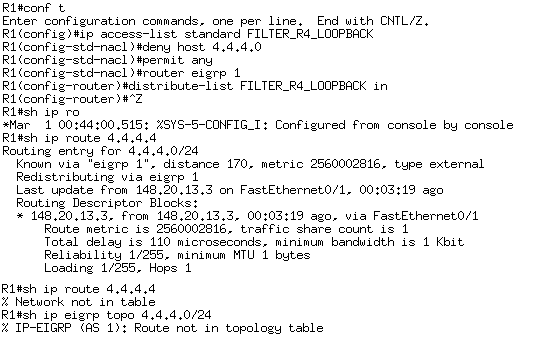 We will use regular syntax on R2 for setting up EIGRP. R2 is announcing it’s loopback. Lets see if we receive that. What more can we configure under the address-family? we can configure timers and BFD as well. 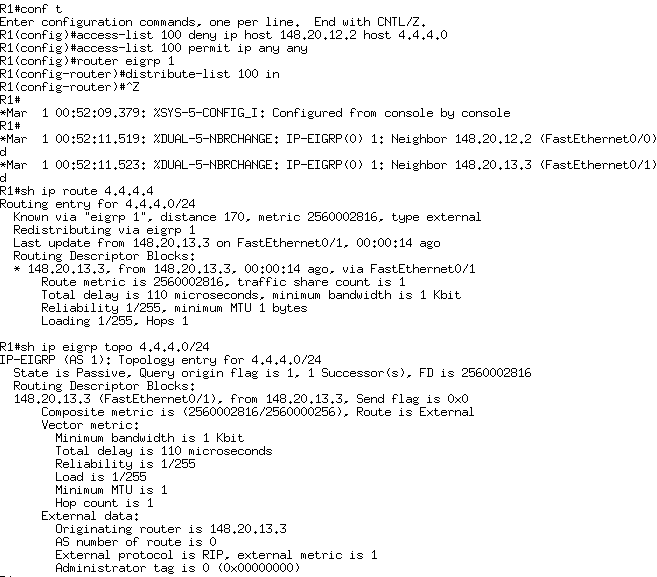 Now we will configure IPv4 in a VRF called 13. Do we receive any prefixes? to the old ip vrf syntax. link local address we don’t even need to configure a global IPv6 address. instead to enable it on all active IPv6 interfaces. like authentication and such. It’s now all done under the address-family. 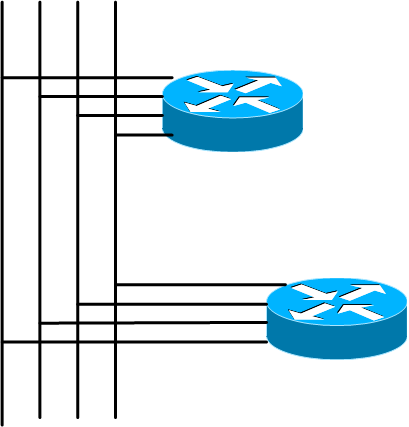 In future posts I will look at Multi Topology Routing (MTR). 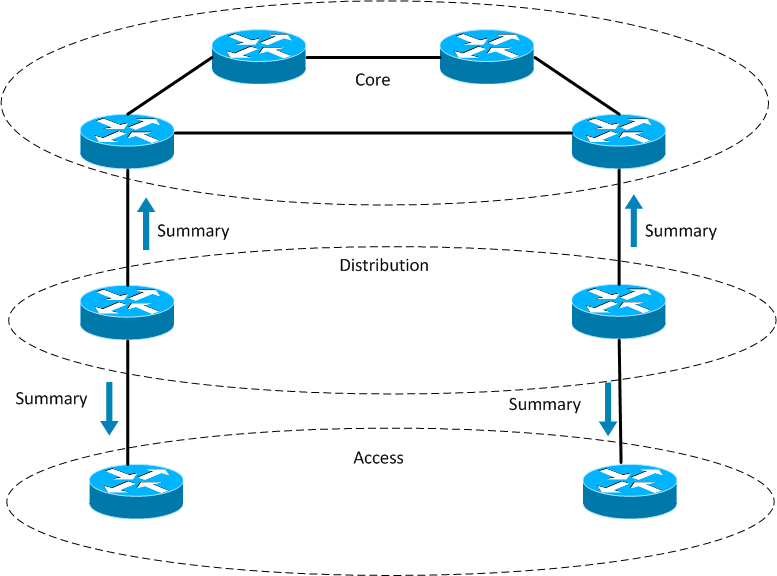 published the IETF draft for EIGRP. findings then straight from the horses mouth? the acronyms used in EIGRP which should be useful for anyone. I just skimmed through the draft and I wish this had been around when I was studying. 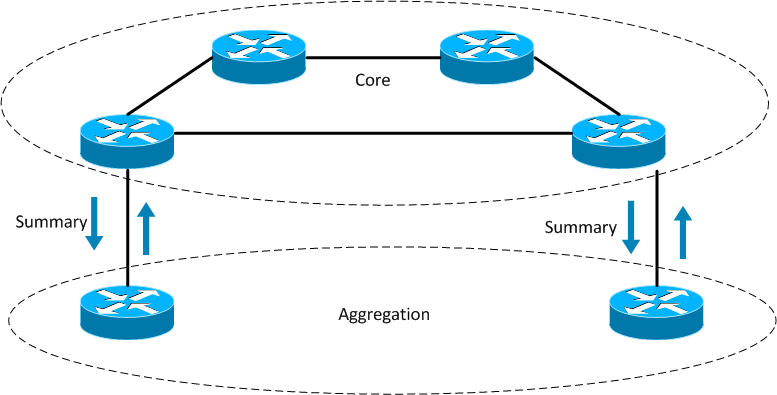 separated by an EIGRP segment. 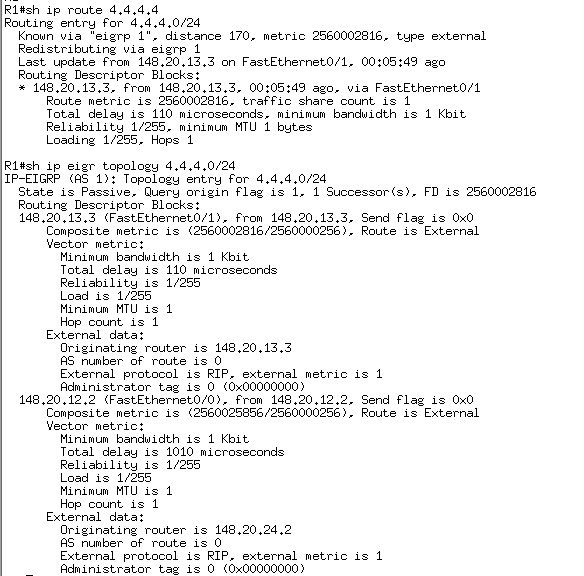 We can see that it came from OSPF 1 and that the ASBR is 10.10.24.2.
is this information carried? Take a look at this packet capture. We can see that a lot of information is carried for external routes. This gives us options when doing tagging and filtering. If we traceroute this traffic will go straight to R2. match on the route-type and incoming interface to block R2 routes. This is a pretty blunt tool but can be good for some scenarios. So what we just did is filter all external routes coming in on Fa0/0. Did we achieve the wanted result? Now all external routes will go through R5 instead. 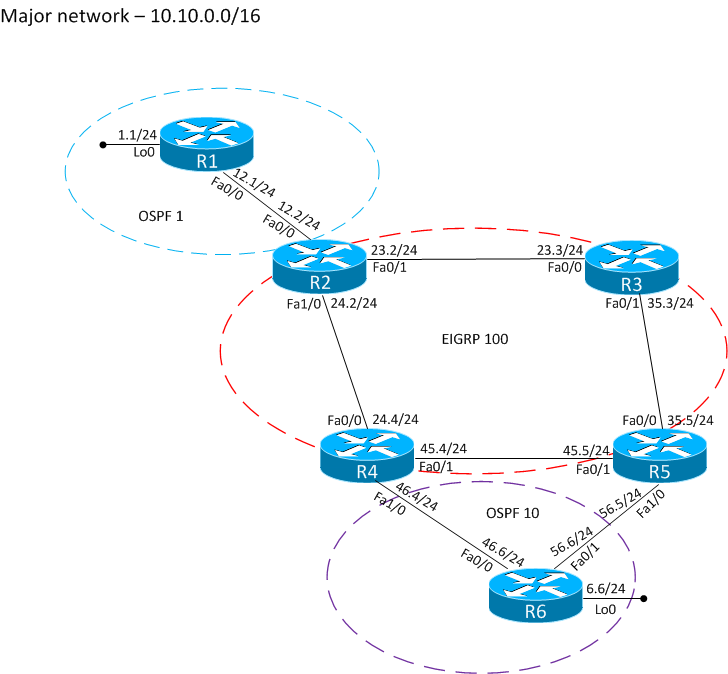 happen with the EIGRP external routes when we do redistribution? From R4 we now look at how it reaches 10.10.1.0/24. is converged there should be no changes. Then we change the metric on R5. We can see that the metric change but at least we have no flapping. Do we still have reachability? both pointing at each other which means we have a loop. redistribute it back to R4. involved in redistribution should have the same policy. filtering. We remove the previous distance commands. and then deny those routes from coming in if they have a tag set. On R4 we tag routes with tag 444 and on R5 we will tag with 555.
the loop should be back. It is still there. Time for some route-maps. First we will confirm on R5 that we now see a tag. We now see the tag. 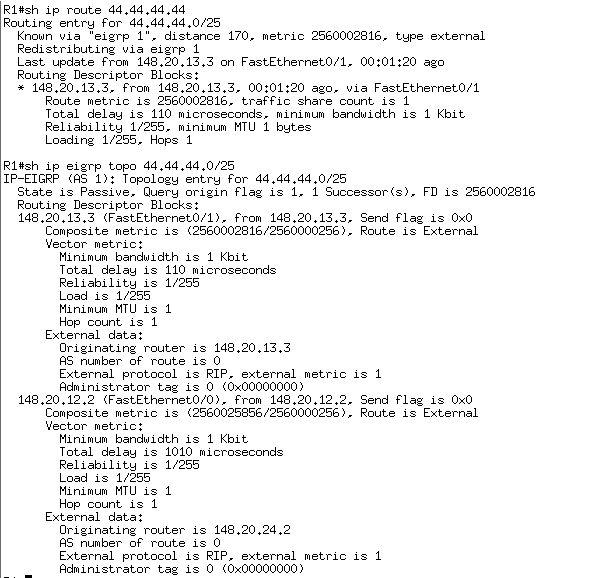 There should be no tag on EIGRP internal routes. We can confirm this on R6. There should be no loop on R4 now. We will test with a traceroute. 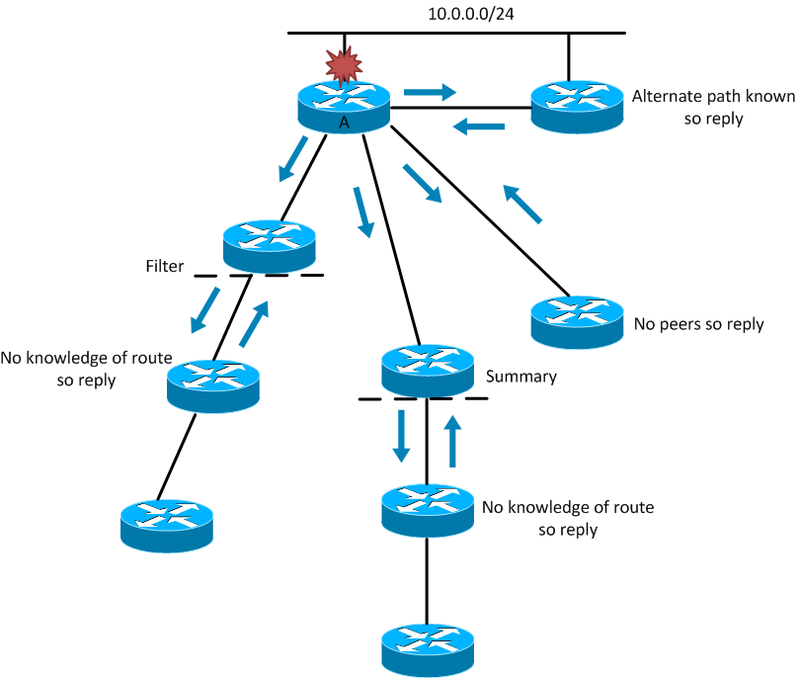 R4 sends routes back to R5 it should stop it from learning them.